Royal jelly, a secretion of worker bees, is the same substance that is fed to all larvae in a colony. When a bee colony needs a new queen bee, a small group of larvae are fed large quantities of royal jelly, and that change in feeding prompts the development of those larvae into queen bees. Recent research has revealed a number of health benefits of royal jelly. Consult with a qualified health professional before supplementing with royal jelly. Royal jelly exerts estrogen-like effects, according to a study published in the December 2010 "PLoS One." The study, conducted at the University of Athens, Greece, looked at three different fatty acid components of royal jelly for their effects on estrogen receptor positive breast and cervical cancer cells and found that, under certain conditions, royal jelly inhibited the cancer cells. The results indicate a potential use for royal jelly in the prevention and treatment of certain forms of cancer. Royal jelly fights cancer by inhibiting blood supply to tumors, according to a study conducted at Gifu Pharmaceutical University in Japan and published in the 2009 "BMC Complementary and Alternative Medicine." In the study, various types of royal jelly were tested on umbilical vein tissue cultures. All had significant suppressive effects on blood vessel formation, with an extract known as caffeic acid -- a naturally occurring molecule found in plants that has anti-inflammatory and immune-modulating properties -- showing the highest level of inhibition. Kidney's are protected from the damaging effects of cancer chemotherapy drugs with the use of royal jelly, according to a study conducted at the University of Erciyes, Kayseri, Turkey. In the study, laboratory rats were given royal jelly along with the chemotherapy drug cisplatin. Improvements were observed in some markers of oxidative stress, and cisplatin-induced changes were partially reversed by the royal jelly. The report was published in the February 2011 issue of "World Journal of Urology." While the results from animal studies do not always accurately reflect how something works in the human body, they indicate that royal jelly might offer health benefits. Insulin resistance and high blood pressure might improve with royal jelly, according to an animal study conducted at Okayama University, Japan. In the study, rats with insulin resistance and high blood pressure resulting from a high-fructose diet were given royal jelly. The rats showed decreased blood vessel constriction, leading to lower systolic blood pressure and decreased insulin and triglyceride levels. The researchers concluded that royal jelly might be a useful functional food for the prevention of high blood pressure and insulin resistance. The report was published in the November 2008 issue of the "Biological and Pharmaceutical Bulletin." Allergy to royal jelly can be severe, and in some cases it has resulted in reported incidences of contact dermatitis, acute asthma, anaphylaxis -- a life-threatening allergic reaction -- and death, according to a study conducted at the Institute for Medical Research, Kuala Lumpur, Malaysia. The researchers of the report, published in the December 2008 "Tropical Biomedicine" journal, state that a high prevalence of allergy to royal jelly exists in some populations. 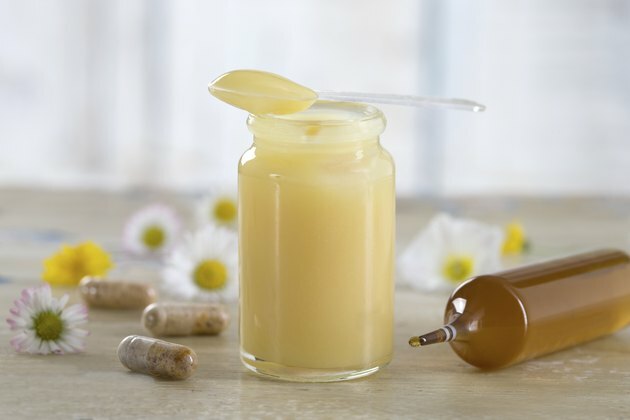 Does Royal Jelly Benefit the Skin?